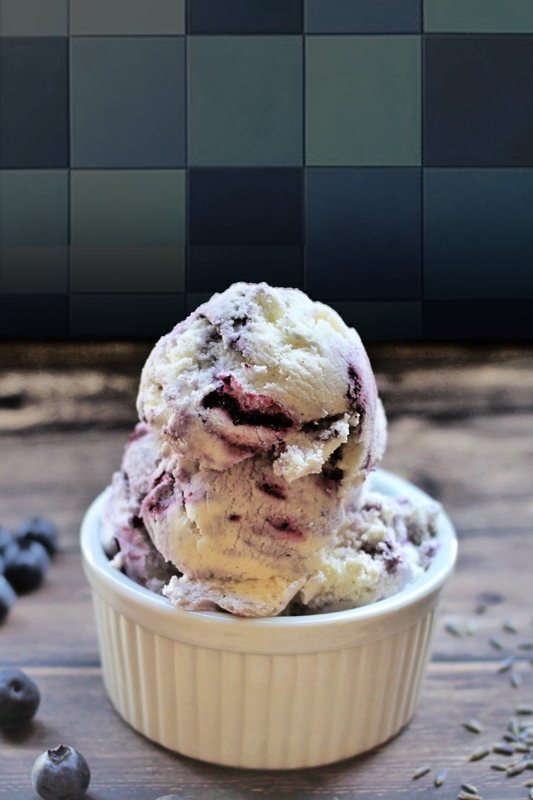 Basil and mint give a delicious, fragrant top note to berry ice creams. Unlike most herbal ice cream recipes, this one calls for leaving the puréed basil in the custard mixture, so a few leaves is all you need. Mint is a nice substitute. Whisk the egg yolks until thickened and light yellow, set aside. Return the mixture to a saucepan over medium-low heat and cook, stirring constantly with a heatproof spatula, until custard thickens slightly (probably when mixture reaches about 170 degrees). Be sure to scrape the bottom of the saucepan with the spatula as you stir. Pour the thickened custard through a strainer and stir into the bowl and let cool slightly. Chill this mixture thoroughly for at least 4 hours, but preferably overnight. When ready to churn, purée a third of the blueberries and all of the basil in a blender or food processor. Fill the canister of your ice cream maker with the chilled custard, the purée and the whole blueberries, and churn according to manufacturer's instructions.